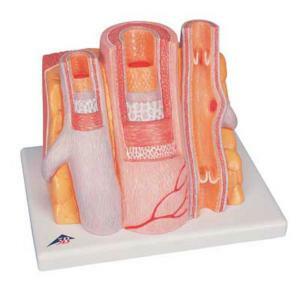 The artery-and-vein model shows a medium-sized muscular artery with two adjacent veins from the antebrachial area and adjoining fat tissue and muscle enlarged 14 times. The MICROanatomy™ circulatory system model illustrates the reciprocal anatomical relationship of artery and vein and the basic functional techniques of the venous valves: valve function and muscle pump. The left vein and the middle artery are fenestrated in the upper anterior segment, revealing the various layers of the wall structure in a cross and longitudinal section and in top view. The right vein is opened throughout in the anterior segment, revealing the orifice of a feeder vein and two venous valves, i.e. flap valves, formed by a duplication of the tunica intima. On the rear of the artery and vein model, the relief of two veins is shown to illustrate the functional aspect of the venous valves. The artery and vein are supplied on a base.